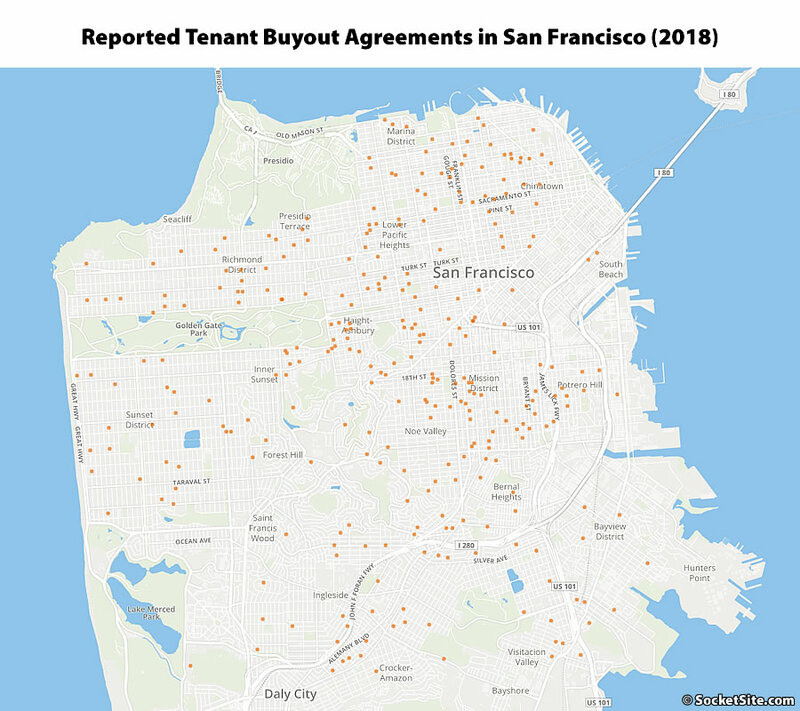 Over the past year, a total of 379 buyout agreements between landlords and their tenants were inked and filed with the City, as now required by law. That’s up 13 percent from the 335 buyout agreements filed in 2017 and 18 percent more than the 320 filed in 2016. The five neighborhoods with the most inked agreements in 2018 were the Mission (44), Ingleside (37), Haight-Ashbury (28), Sunset (24) and the Inner Richmond (23), with Eureka Valley, which topped the list with 35 in 2017, having dropped to seventh place with 21. 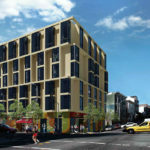 The highest reported buyout last year totaled $235,000 for four tenants in Lone Mountain, with the highest reported buyout for a single tenant hitting $200,000 (not including the value of additional, non-cash, consideration) for a unit on the 2400 Block of Gough Street in Pacific Heights. And according to our queries and calculations, the average buyout agreement totaled $47,638, or $33,096 per tenant, last year, that’s up from an average of $42,806, or $27,495 per tenant, in 2017. It’s a pity that the data does not, so far as I can see, include such key data as the pre-buyout rent and the number of years the tenant was in the unit before the buyout. I was completely in favor of our City’s “progressive” pro tenant legislation when I was in my 20s. In my 30’s I began to question it as I saw more and more examples of how it wast actually working and what that meant for large parts of our city that had neglected buildings. Now in my early 40s, the more I see how SF is run, I feel the more fiscally republican I am turning. The idea that people should be paid this kind of money to vacate a house that is NOT theirs and whose upkeep they don’t have to care about, is baffling. This whole ‘poor tenant, demon landlord’ they seem to chant at City hall is tiring. Ah, yes. A vivid example of how the young people who think they understand the world, really don’t. Congratulations on seeing the reality of rent control in SF and its repercussions. The sad thing is that many of those being “helped” by rent control are wealthy and are just benefitting at the expense of their landlords. Needs testing would be a great step toward a more equitable and sane version of rent control, but I’m not holding my breath. I found all the paper work to do a tenant buy out frustrating and so I just sold my property. New owner is doing an Ellis Act eviction. But hey guess this legislation helped tenants somehow? When I rented I was much wealthier than my landlord, but got rent control anyway. It was so dumb. I said to him: this is dumb. He said, I know, but eventually you’ll get married and move out and then I can raise the rent. I asked if he picked me because of that. He said yes, of course. Eventually I got married and moved out and he raised the rent on the next tenant, whom he surely also picked because he thought they would move out soonish, thus showing yet another terrible unintended consequence of rent control. If anything needs to be “resisted”, it’s unsustainable and unfair rental price controls for the exclusive few that ridiculously, includes even wealthy people. Does the person who received 200k know it’s taxable income? It should not be very hard to pay tax on money you basically stole, with the help of the leftist city government, rather than having to work for it. Kick back some of that ill gotten gain to the government, consider it a commission. Your assumption of criminality is completely backwards: big buyouts happen when there was illegal activity on the landlord’s part. Most of that $200k is an out-of-court settlement for something that the landlord wants to cover up. agree with you completely — didn’t mean to imply I thought it might be a hardship to the payee. In 2010 my firm leased office space in Palo Alto for 10 years. In 2015 we didn’t need it any longer, moved out and subleased it. We make about $1 million a year on the increased rent between the sublease and our original lease. That’s how it works. You sign a lease that ends up being very valuable because market rents rise, you get to collect from your smart move. The landlords here could have just kept operating under the tenants’ lawful lease but calculated it was more valuable to buy out the lease. Simple business. This is a fair deal. You negotiated the term and you make money because the market rise above the initial term. On the other hand, I heard far more stories about business wanted to stay after their 10 years lease expire and were struggling to handle the dramatic rent increase. This is natural give an take. In residential market, it is economically rational that rent for a, say three years term, to be lower. And the rent for where the tenant has an option to extend the term for the rest of their life to be higher. However, our city say only second option is legal. So everyone pays higher rent. It hurts young people more because the law is biased for people who wants to stay put for the rest of their life. For those who complain about rent control, care to explain why Prop 13 is any different? It’s different because not only do property owners get huge subsidies through prop 13, unlike renters they also get to write off their mortgages and all of their monthly payments are actually building up an investment/ asset. Well, Rent control applies only to your primary residence, while you can reap the benefits of Prop 13 on as many investment properties as you can afford. And you can’t pass your rent controlled rent onto someone else, while Prop 13 benefits can be passed on to heirs. If you retire and move out of your rent controlled place, you won’t be able to transfer your controlled rent the way a retired property owner can transfer their tax assessment. Yep the two are pretty different alright. Actually it doesn’t need to be your primary residence as long as the original tenant continues to pay rent to the landlord. I’ve had a former tenant sub-let their apartment to a friend (at less than or equal to what they paid because to charge more would be illegal) while living full-time on the East Coast claiming that they do come back to San Francisco for work periodically. Understood on your other Prop 13 points. A tenant in occupancy is a person who actually resides in the rental unit as his or her “principal place of residence” … Occupancy does not require that the individual be physically present in the unit at all times or continuously, but the unit must be the tenant’s usual place of return. How did this devolve into another rent control/Prop 13 argument?? Both hurt new people trying to come into the city and both aren’t going anywhere. A friend of mine makes mid-six figures and rents a $1700 unit in Pac Heights. She will never leave. I have several neighbors in their late 80s who have owned their homes for generations going back to the 19th c., they will only leave when they die. I’m not sure how the city will handle property transfers among family. “San Francisco’s property tax roll grew by 22 percent over the past two years to $260 billion from $212 billion, according to Chu’s office. The more than 211,000 properties in San Francisco generate over $3 billion in property tax revenue each year to pay for public services. The city has received a $415 MM windfall from increased property taxes as prop 13 valued homes turn over which allowing the city to dedicate almost $200mm for more affordable housing. There were like five property owners whining about rent control before somebody finally couldn’t take it and pointed out the hypocrisy involved. Intervene earlier next time! As far as “not going away” is concerned, Prop 13 for commercial properties has maybe 20 years left. Rent control will have to change at the same time. Prop 13 for commercial properties first date with destiny is next year. If that initiative doesn’t pass, we’ll be back to vote on it again and again until it passes, like the potheads did with Prop 64. It’s not. That’s the problem. Rent control is just prop 13 for renters. Prop 13’s already basically destroyed our state, Rent Control will be just as bad. Sure: rent control ensures the owner of a rent controlled apartment is protected on the upside and downside. If rents go up, they’re immune; if rents go down, they can move or renegotiate. A property owner owns right to future cashflow. Prop 13 doesn’t protect them on the downside if the land becomes less valuable – they’re still out the value of their capital asset. Prop 13 is a subsidy to those who are long land value. Rent control is a subsidy to those who are short land value. Which population does a city want to encourage? Given the blighted buildings throughout the city, we should both hope it’s not too many of the latter. You are confusing the value of the contract with the value of the asset. The Prop 13 equivalent to renegotiating a lease is that you can request a new tax assessment if you believe your old one is too high. As far as the value of the asset goes, tenants don’t have equity so they have neither upside nor downside exposure. Only the asset is an investment in the usual sense of something you capitalize in order to improve its value. Describing a rent controlled lease as an “investment” is a very vague use of the word and it leads to vague thinking like the above. Many tenants don’t even have significant retirement savings, they are just hanging on in SF as long as they can. They are not “investors” pursuing some Freakonomics-inspired arbitrage strategy using tenant rights. Who are you trying to fool? You bring up a fair point: real estate is an asset and rent control is something more complicated and definitely not an asset. However, I’m not sure that matters in this conversation. Rent control is a contract term of a purchase paid in installments which, over time, manifests as rental yield captured by the renter instead of land owner. In particular, because of SF’s rent control caps pegged as a percent of inflation, it is guaranteed that over time the rental yield captured by renters increases to the entirety of the asset’s yield. This is make especially apparent by the rent boards arbitrary final say on pass through increases for capital improvement or operating cost changes (eg last year’s decision that property tax reassessments due to transfers could not be passed through). So the difference in my original point still stands. Rent control is a contract term which gives renters the guarantee of capturing all developed value if they can hang around for long enough, with no downside. Prop 13 allows landowners to capture any increase in developed value but does not protect them as asset owners to downside risk. Whether tenants are sophisticated enough to understand this mechanism is irrelevant to the conversation. We’re trying to compare two policies and in particular trying to determine how closely they are or should be entangled. Postulating immortal tenants, sure. Back in the real world, we all know that’s not what happens. Of course, Prop 13 owners do get to pass their entitlements along indefinitely, in which case your math predicts the starvation of the state government. Fortunately, the fraction of people getting rich off Prop 13 also goes down over time, so eventually democracy will fix the problem as Brahma pointed out. They needn’t be immortal. They only need to be commonplace, such as the many thousands of tenants who began renting flats in the 1990s through the late 2000s, and continue to live in the same places. While there are always exceptions and outliers, keep in mind that the average tenancy for a rent-controlled apartment in San Francisco was around 9 years, versus 6 years for a non-rent-controlled unit, as of a few years ago. If the market value of your property falls below the assessed value of your property you can have your assessment lowered under prop 13. This was pretty common in the 2009-2012 period. Property owners take advantage of the lower value, which then effectively “marks-to-market” back up until the value increases to the original valuation that would have applied under prop 13. Your conclusion about exposing property owners to ‘downside’ risk doesn’t really hold in that sense. Still, I don’t really buy the ‘Yeah but evil landlords have prop 13’ argument, because that 13 regulation addresses the state contract (taxes) with private citizens. Rent control dictates how private citizens can contract with one another. The regulation of private commerce occurs in many parts of our lives – but as the vast majority of the country exists easily without rent control, there’s no reason why it should exist in San Francisco, except that people will vote their own benefits. The market eventually finds a work-around. As capitalization rates compress, the rental yield is small enough so as to invite counter-market solutions like Ellis Act evictions. If your rent collected is ($100) 1/3rd the market rate ($300), does it make sense to give up $300 * 5 years ($1,500) in exchange for an extra $200 each year forever at a 4% cap rate? The math on that is $200/.04 = $5,000. Is $5000 > $1500? Then Ellis Act is rational. (Yeah yeah, add back in the relocation costs etc. I have oversimplified, but the argument remains). What social good is done by giving landlords a reason to hold their properties off-market for 5 years? Keeps fewer of them from Ellis-ing, right? So who wins? The landlord makes money by Ellis-ing – he/she wins. The other tenants whose landlords don’t Ellis win. The new entrants who would love to pay for one of the units held off market for 5 years lose. The tenants who had to move obviously also lose in that they have to find another place to live. Right.The average is 9 years, basically confirming that there are a great many thousands of renters in the ~20 and higher year range. Because given the preponderance of renters who stay in places for a few years, the median is probably closer to that mark, a few years or so. There have been several broad insults against tenants, but you are the first person to use the phrase “evil landlords” here. Good vs evil aside, Prop 13 is certainly far more of an economic distortion than rent control. Tenants do have upside. Their frozen in time rent becomes more money in their bank accounts as time goes on. Also, depending upon various leases, tenants can profit from sub-leasing, roommates, short term rental sub leasing. Do not pretend that the many, many tens of thousands of San Franciscans paying 1990s and early 2000s type rent are not enjoying upside. They are. You can use the word “upside” to mean two very different things, just like “investment”. If you’re trying to make an argument on a real estate site, I think it’s best to use the words in their strict sense. Yes, if you are a Freakonomics type you can describe a rent-controlled lease as a derivative security of the underlying property, in which case the Prop 13 guarantee is a similar instrument. The false equivalence is when you compare an asset like a house to a contract that cannot be sold like a rent controlled lease. It is flat out misleading to compare a lease to a real asset like housing, bonds, or equities. Not everything that has value is an investment. It’s like a life estate, except that you pay rent. Which is to say, it’s not like a life estate at all. There is an obvious precedent for rent control which is that it’s the poor man’s Prop 13. Why work so hard to find more exotic comparisons? It’s really not very difficult, thanks. Yes tenants pay rent. In SF that’s a fixed amount that grows functionally grows incrementally less expensive over time thanks to inflation. In a life estate one pays a much larger sum initially to obtain a life estate, and also perhaps a fixed amount over time if there is a mortgage. Both parties have use of the property for life if they adhere to making monthly payments. It’s like asking why are people complaining about robberies when there are people committing extortion. They are both wrong. They should both end. I have to say though, rent control is illegal taking (the Supreme Court will eventually come to that conclusion even if it has not done so in the past), while Prop 13 is merely bad tax policy. We had a rear guest unit behind our house that sat empty for 11 years before we sold the property. You cannot get rid of a bad tenant without feeling extorted and the rent income isn’t worth the risk of that nightmare. As a slow convert to conservatism, I’m outraged by the liberal bias against landlords. I agree rent control is an affront to the smarter class’s purging of undesirables. For example, a friend bought a 20 unit building at the peak of the first dotcom bubble and was barely able to evict all the owners, including several weak octogenarians burdening the neighborhood. She was vilified in Street Spirit — that homeless newspaper. San Francisco should assume its rightful place as a city of winners only, and purge the weak who don’t value money properly, instead wastefully investing their time and energy in other things. High rents and the ability to manipulate tax and other law are merely signs of superiority. Socializing loss and privatizing profit are signs of viral strength and superior breeding. If you don’t have it, move or be crushed. I live in a condo building. The next-door neighbor is a senior VP at Amazon who uses the condo as a pied a terre. He stays at the condo a few days a month. The owner of the unit recently passed away. The heir wanted to sell the unit. The Amazon VP got free attorney from the city of San Francisco, and walked away with $100K of buyout package. I later found out that this senior VP reports directly to Jeff Bezos. He is probably a billionaire. San Francisco rent control law benefits the rich; just like communism in China. That’s eviction control, which is a separate issue from rent control. Your neighbor’s heir could have raised the rent on the unit, they could have invoked the Ellis act, or the next buyer could have done an owner move in. Either your neighbor’s heir is a fool or you are misinformed.